Where did that weekend go? Did it fly by for anyone else? I was supposed to get all of my Christmas cards done. I do not have a single card addressed and I am missing a whole bunch of addresses. I’m thinking I maybe printing labels last minute at the rate I am going. I ordered my cards really early this year so that I could get them out sooner this year. Have you gotten your cards out yet? If you have, I’m proud of you for getting them done! I LOVE this scarf. 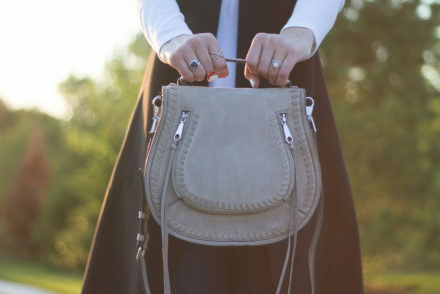 It can be worn so many ways. I choose to wear it one of the more unique ways for you guys because I haven’t seen many scarves that can be worn this way. The company that produces the boots I am wearing are based near me. I love that it’s something local. They came out with another pair with more fringe that are super cute! I had a holiday card fail this year, we didn’t even order them, oops! There’s aways next year. 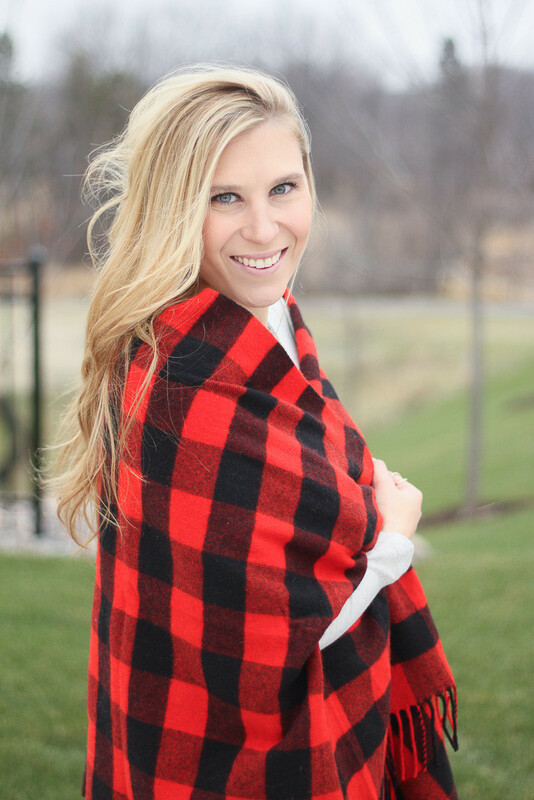 Love your buffalo check wrap, super cute! Love that scarf!! It’s perfect! I love that buffalo check! Obsessing over this scarf! So fun for right now and so festive! Great look Lindsay! Love the buffalo print plaid! Beautiful in this buffalo check! So festive and fun. I love that print! Those fringe boots are so fun! This is like, my dream scarf! If I can’t wrap it around myself like a blanket, I don’t want it! Lol. 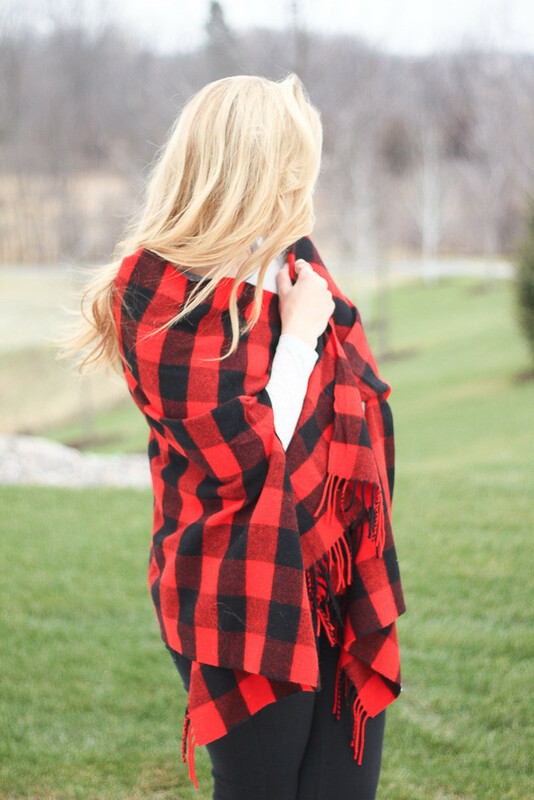 Buffalo plaid is so perfect for this time of the year! You look so cozy and those boots are amazing!! Very pretty! Thank you for sharing and have a wonderful week! What a scarf! Love it! This is a perfect piece to put on when the temperature drops suddenly. These days the weather cannot decide which way to go… One day I am curled up in two blankets and the next one I turn the AC on. 🙂 You look perfectly polished and effortless! Such a cozy shawl! I bet you’ll get a ton of use out of this piece. 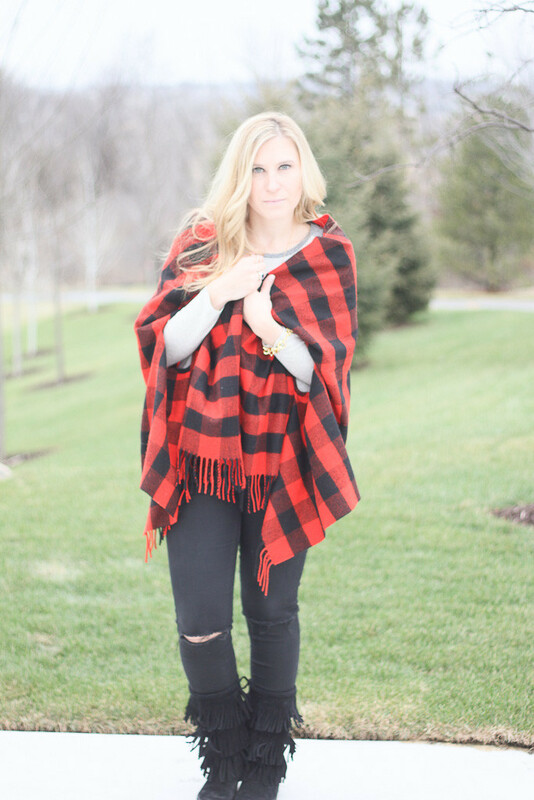 You can never go wrong with buffalo plaid! I love this cape! That poncho is adorable! 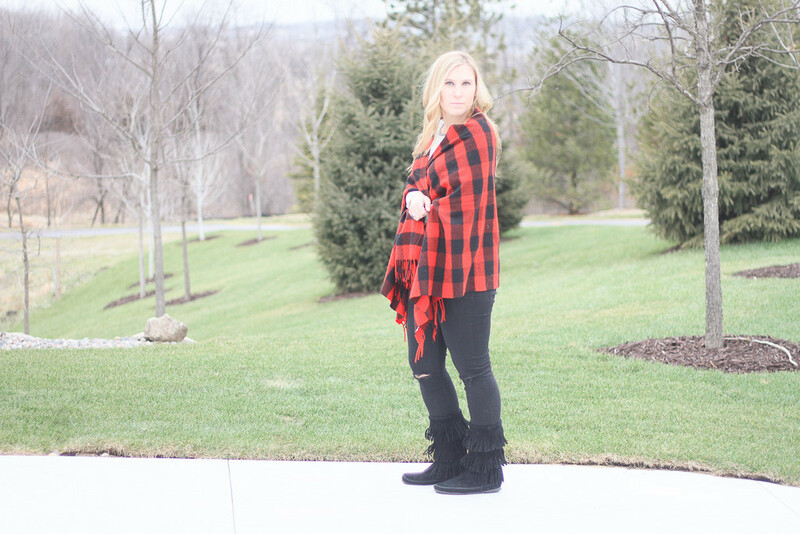 Love the buffalo check and it paired with the fringe boots! I really need to pick up a blanket scarf! You look so cute! 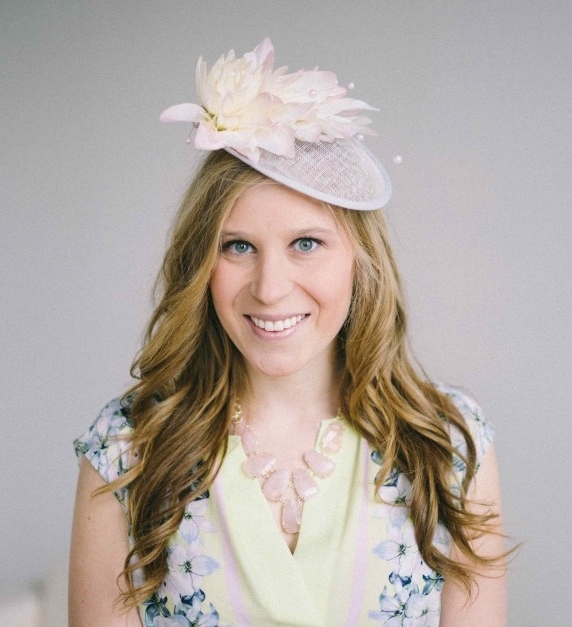 You look so pretty & cozy-chic in these photos! Love blanket scarves like that, you can wear them so many ways and they are so comfy! Such a cute and cozy look! 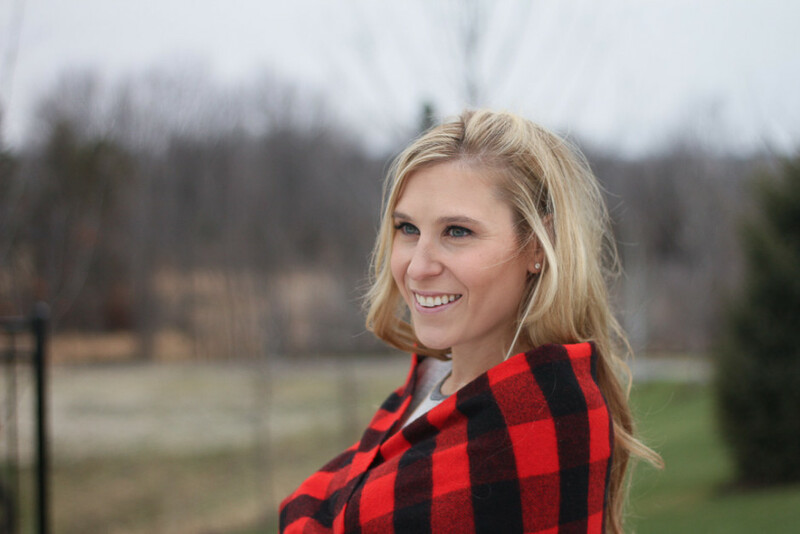 I love a classic buffalo plaid check. And those fringe boots are the perfect accessory!